To mutually expand their customer reach and take advantage of the bustling local tourism industry. A subsidiary company of Gokongwei business, Cebu Pacific Air has partnered with another JG Summit Holdings, Inc. enterprise. GetGo is the newest lifestyle rewards program that gives its members free flights and other benefits just by flying with Cebu Pacific and from everyday spend. Currently, GetGo has over 2.1 million members nationwide. GetGo, has joined forces with Go Hotels and Summit Hotels and Resorts to synergize their resources amid a growing tourism industry marked by increased local travel and hotel accommodations. As an essential service hotel, Go Hotels lets travelers pay only for the basic things they need. Other services can be availed of through add-ons, ensuring a complete and convenient travel experience. Operating with a “book early, pay less” concept, the hotel’s affordable room rates reward those who plan and book early. The company’s growing portfolio of hotels in Mandaluyong, Ortigas Center, Otis-Manila, Bacolod, Butuan, Dumaguete, Iloilo, Puerto Princesa, Tacloban and soon-to-open in Lanang-Davao and Manila Airport Road, is a testament to the emergence and growing number of smart travelers. As the mid-scale hotel brand within the Robinsons Hotels & Resorts portfolio, Summit Hotels and Resorts is comprised of a collection of unique boutique hotels situated in the center of key CBDs and tourist destinations. These include Summit Hotel Magnolia, Summit Ridge Tagaytay, Summit Circle Cebu and Summit Galleria Cebu which will soon rise in General Maxilom Avenue, Cebu City. “Our partnership aims to provide the best reasons for people to satisfy their desire to travel. 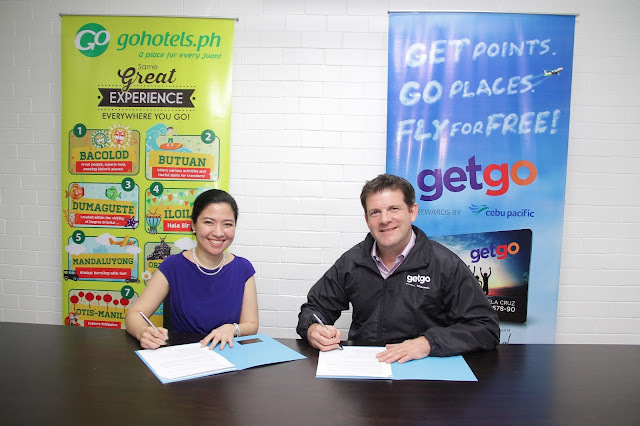 GetGo members are encouraged to travel more and stay longer in Go Hotels and Summit Hotels and Resorts nationwide, to earn GetGo points for free flights,” said Nik Laming, GetGo Loyalty Division general manager. “Our team-up with GetGo reflects our intention to have strong synergies with other JG Summit brands, to expand the loyalties of our respective customers and grow our client networks,” said Elizabeth Gregorio, Robinsons Hotels and Resorts general manager. What will be the Exclusive offers? The partnership between the two companies under the JG Summit conglomerate also paves the way for exclusive offers that will enable travelers to turn hotel stays into free flights. A GetGo member can easily earn 2 points for every P100 spent booking at any Go Hotels or Summit Hotels and Resorts properties. “Instead of getting the usual discounts for booking with our partner hotels, travelers earn points which they can save and grow to avail of free flights for future adventures,” added Laming. Those who want to avail of the GetGo card can visit www.GetGo.com.ph, click JOIN, fill out the application form, and have their personalized GetGo card delivered to their doorstep for only a P150 membership fee. In order to cater to the needs of the economic travelers, there are plenty of budget hotels and resorts in the city which present very affordable and economic accommodation in Abu Dhabi.